This spring Protect Environmental Services will be entering its twenty-first year in business serving the emergency spill response needs of the North Texas area. 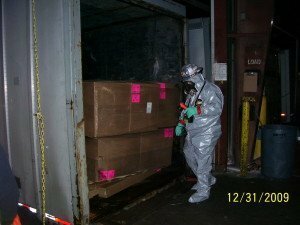 Unlike other companies, Protect has operated from the beginning specifically dealing with chemical and bio-hazardous materials. Our goal has been to provide timely, cost effective cleanup solutions for companies and government entities and since 1996 we’ve completed over 10,000 disposal and cleanup jobs that required trained HazMat personnel. In twenty years we’ve established a reliable system and solid track record for tackling our clients’ environmental needs. The following are just a few of the benefits of choosing Protect Environmental as your HazMat responder. Timely response for emergency spills: With offices in Irving and Haltom City, Protect is capable of having crews on site for a cleanup anywhere in North Texas. Our phone lines are monitored 24/7 so when a client places a call, they’ll get in touch with someone who will get the response rolling. Trained and competent personnel: At Protect Environmental, we view HazMat response as more than just cleaning. Our teams identify risks and come up with strategies that effectively contain and remove contamination with the maximum level of safety. Supervisors and technicians continuously train with equipment and PPE to ensure that everyone and everything works the way it’s supposed to when a spill response is called for. Knowledge of spill reporting procedures and regulations: The TCEQ and EPA have very specific guidelines for when and how to report chemical spills and responsible parties that don’t comply could face fines or criminal prosecution. Protect’s staff have worked with the TCEQ on many occasions and can make sure that all the reporting requirements are being met. Thorough and accurate reporting: Every spill that Protect responds to is documented from beginning to end. Our clients are given photographs, maps, waste manifests, equipment ledgers and activity logs relating to the removal of the contamination and legal disposal of wastes. This detailed and accurate reporting provides a solid defense for responsible parties against litigation and penalties from the state. Scaled response: Seeing thousands of spills has reinforced the fact that every spill situation is unique. Many spills may share some characteristics but factors such as material type, spill location, nearby waterways and the weather all influence the equipment and manpower needed to contain and remediate the spill. Rather than deploying unnecessary resources at the expense of the client, Protect teams immediately assess the situation and incorporate client wishes into finding the fastest, most economical solution. Over the years, Protect has grown and adapted to the changing nature of the industry and the needs of our clients. We continue to believe that no single claim to fame is a substitute for experience, adaptability and transparency. That is why Protect is called to respond to bio-hazard cleanups, multi-month remediation projects and everything in between. Contacting our office to learn more won’t cost you anything so feel free to speak with our staff and find out what Protect Environmental can do for your organization.